Several authors have estimated that a PRRS outbreak could cost a mean of approximately €100-200 for each sow in the farm. After analysing PRRS outbreaks in nine sow herds, Dutch researchers calculated that the number of sold pigs per sow could be reduced by up to 1.7 (-18%) and that the impact cost of PRRS during the outbreak taking into account production data, medication, diagnostics, labour, etc. resulted in losses of between €59 and €379 (mean loss €126) for one sow per 18-week outbreak period. In general, farms suffered decreases in the number of live-born piglets (from -2 to -17% per parturition; mean -8%) and increments in mortality rates preweaning (from +17 to +124%; mean 36%) and postweaning (from 85 to 350%; mean 167%). Measures applied to control the infection. Other reports suggest a similar impact of the disease in other European countries. For example, analysing PRRS outbreaks on Spanish farms, it has been estimated that losses in a phase 1+2 farm (2,500 sows) could be as high as €222,000 during a six-month period. Moreover, costs related to be positive and unstable (i.e. birth of viraemic piglets) are in the range of €30-50 per sow/year even with no clear clinical manifestations. U.S. researchers (2013) estimated that the annual cost of PRRS in their country was US $664 million (period analysed 2005-2010), i.e. more than U.S. $100 million compared to a previous study (2005). 2005 study. Losses in the breeding herd accounted for 12% of the total cost. 2013 study. Losses in the breeding herd accounted for 45% of the total cost. According to the 2013 study, total additional costs (indirect costs) attributed to PRRS, such as vaccination, biosecurity, etc. might be US $477 million per year. Thus, both direct and indirect PRRS costs in the U.S.A. may exceed one billion (US $1000 million) per year. Some authors have estimated that PRRS annually causes 8 million fewer pigs weaned. The impact of the disease in Canada and Mexico may be similar. In Japan, researchers have estimated that the total annual losses due to PRRS in that country were US $280 million. Their estimations included losses of suckling (-6.7%), weaned (-30.7%) and fattening (-13.7%) pigs and increases in abortions (+36.4%) and stillbirths (+6.6%). Overall, they have estimated a daily weight gain decreased of 5.8%. 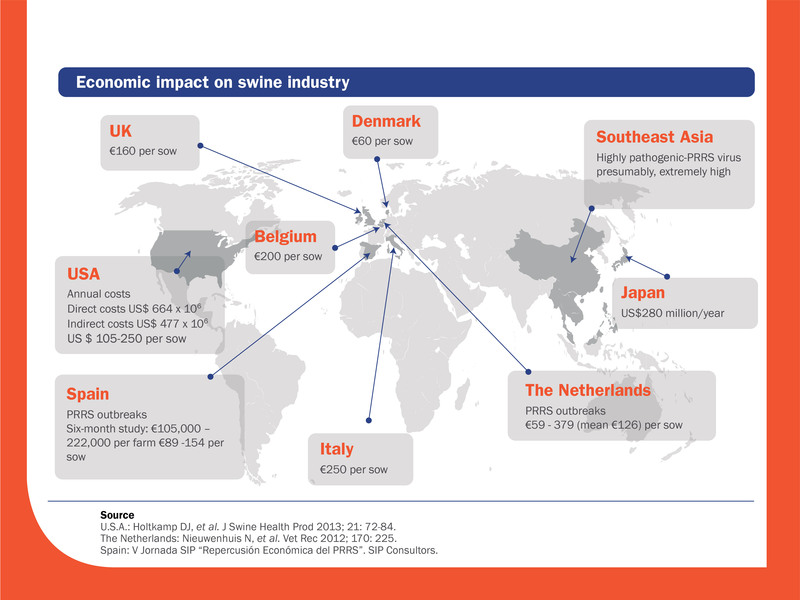 It can be assumed that the emerging of highly-pathogenic PRRS virus strains in Asia has significantly increased the PRRS economic impact on that continent. Just as an example, it has been estimated that PRRS in Vietnam has much greater impact on the meat market than any other animal disease.